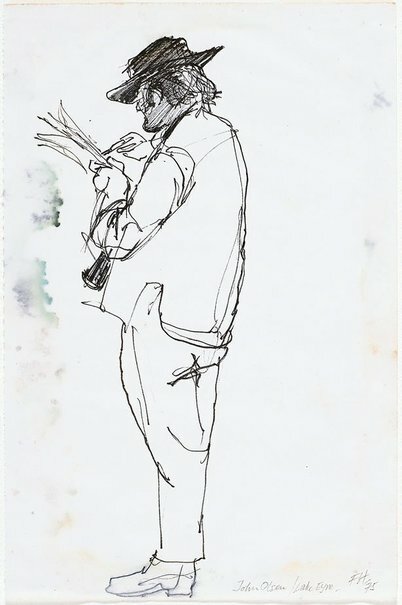 This portrait of John Olsen is a candid and spontaneous study made in 1975 on a trip to Lake Eyre, where Hodgkinson accompanied Olsen, Tim Storrier and naturalist Vincent Serventy. The lake was flooded for the first time in decades, with a resulting abundance of life attracting artists and scientists alike. The AGNSW has works in the collection by both Olsen and Hodgkinson that resulted from that trip - in fact, this drawing is on a sheet from one of Hodgkinson's sketchbooks already in the AGNSW collection. Signed and dated l.r., pencil "FH/ 75".